It isn’t often that an architectural interior designer from Detroit with a battery-operated reel-to-reel tape recorder captures a vitally important moment in history, but Carl Benkert, a man who happened to fit the aforementioned description, managed to accomplish just that. 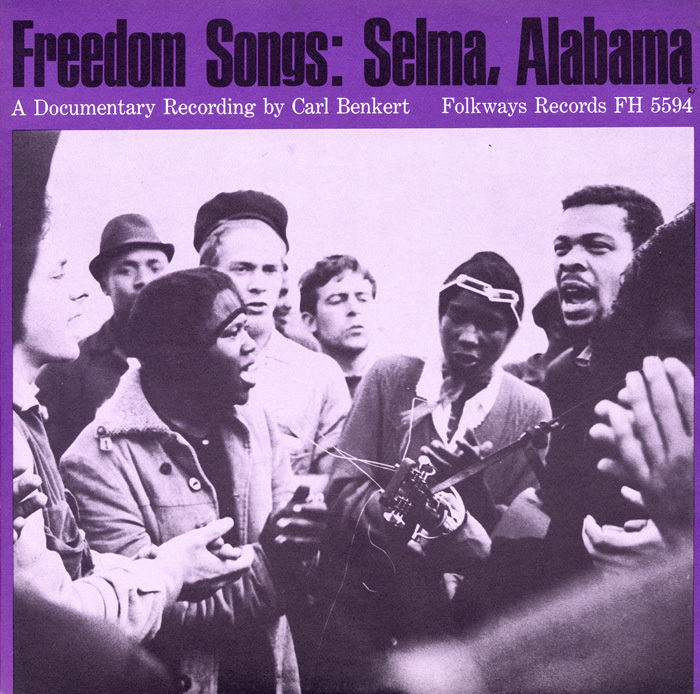 In the year of 1965, when the Civil Rights movement was in full swing, and protesters were marching from Selma, Alabama to the State Capitol in Montgomery for access to the voting registration, Benkert recorded live freedom songs, chants, and speeches that were released in a documentary-album, “Freedom Songs: Selma Alabama.” One of the tracks (found in the hyperlink above), titled “Steal Away, Nobody Knows the Trouble I’ve Seen” caught my attention as it captures the spirit and constant evolution of the complex African American Spiritual. While other musical traditions in North American such as Sacred Colonial Songs or American Indian music contain a strong and definitive presence of responsorial singing, African American spirituals have a unique take on the matter that seems to maintain traction throughout the 19th and early 20th century. Known as the “singing man” by many, spirituals have generally been led by one singer who introduces melodic material that is then repeated and varied upon by the “congregation,” or participants. In Benkert’s recording, Hosea Williams, a Civil Rights leader and member of the Souther Christian Leadership Conference, acts as this “singing man,” providing the melodies of two spirituals, which are answered by his fellow protestors. In addition to this call-and-response style comes an element of improvisation and variation that has been present throughout the history of spirituals. Author of 1867’s “Slave Songs of the United States” William Frances Allen touches on this subject, describing how “there is no singing in parts as we understand it, and yet no two appear to be singing the same thing.” This improvisatory tradition can be found in “Freedom Songs: Selma, Alabama” through the various declamatory vocables, including a man shouting “Come on,” and the distinctive bass and soprano voices. SUDDEN AND WILD TANGENT: BUT WAIT, AREN’T THESE PERFORMERS SIMPLY LOWERING THE THIRD AND THE FIFTH TO ACHIEVE THESE VARIATIONS? NO, I’M GLAD YOU ASKED. While using buzzwords such as “loose harmonies” are decent descriptions for the Western-oriented reader, listening to varied live music is the best way to capture the true distinction found in African American music. By comparing two saxophone players from different backgrounds, such as Kenny G. and Charlie Parker, we can quite easily see the emotional, personal, and distinct differences that cannot be captured through Western imitation or transcription. END OF SUDDEN AND WILD TANGENT. Another simple means which connects spirituals of the 18th and 19th century and the civil rights movement is the purpose behind and use of biblical texts. As put in the Crawford text, many original spirituals fashioned traditional biblical stories into songs of a “sober dignity and moral force” that were sung in ways that “condemned slavery, affirmed faith in God, and tapped the depths of human souls.” In other words, found not in our beloved textbook, spirituals were transformed in ways that signaled and led the ways for racial equality. To see such iconic pieces as Steal Away and Nobody Knows the Trouble I’ve Seen still being presented and utilized in a constant fight for equality during the March to Montgomery is a testament to the inherent emotional core of African American spirituals. Crawford, Richard. America’s Musical Life: A History. New York: W.W. Norton & Company, Inc., 2001. Freedom Songs: Selma, Alabama. Folkways Records, Streaming Audio. Accessed October 3, 2017. http://search.alexanderstreet.com/view/work/bibliographic_entity%7Crecorded_cd%7C72058. Kirkland, W. M.. “Hosea Williams (1926-2000).” New Georgia Encyclopedia. 23 December 2016. Web. 02 October 2017.